Construction work on Vienna Main Station is moving ahead swiftly. The first section of the biggest rail-station project in Austrian history is scheduled to go into operation as early as next year. To carry out the extensive in-situ concreting works, the ‘HBF-Wien 01’ consortium turned to an economically optimised formwork concept from Doka. The new Main Station being built in Vienna at the site of the former ‘Südbahnhof’ station is a development of epic proportions. A million cubic metres of excavated material, 300,000 cubic metres of concrete, 38,000 tonnes of reinforcing steel, 38,000 linear metres of bored piles – figures like these say it all. The huge volume of construction to be undertaken here, the tight timetable and, in some cases, the difficulties of accessing the site call for 100% commitment from all involved, and especially from the contracting JV of Strabag, Alpine, Porr, Pittel & Brausewetter. 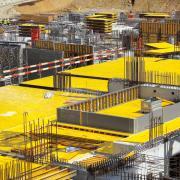 All the extensive in-situ concreting is being carried out solely with high-performing formwork equipment from Doka. 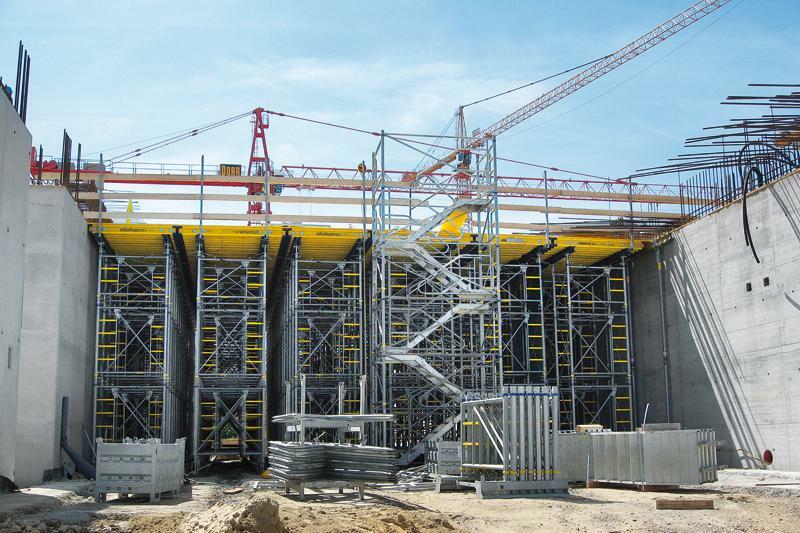 The main reasons behind this decision were the Vienna Branch’s technical and logistical expertise in carrying out large-scale projects, the comprehensive planning services offered by Doka and the rapid availability of the necessary formwork resources from Doka’s high-capacity rental park. “To make a success of handling a construction project as big as this one, you need not just perfectly organised site coordination, but also, and above all, professional partners with sufficient experience and capacity. The Doka Vienna Branch brings both of these to this project, and has more than met our high expectations”, stresses the JV’s Project Manager Georg Pleva. 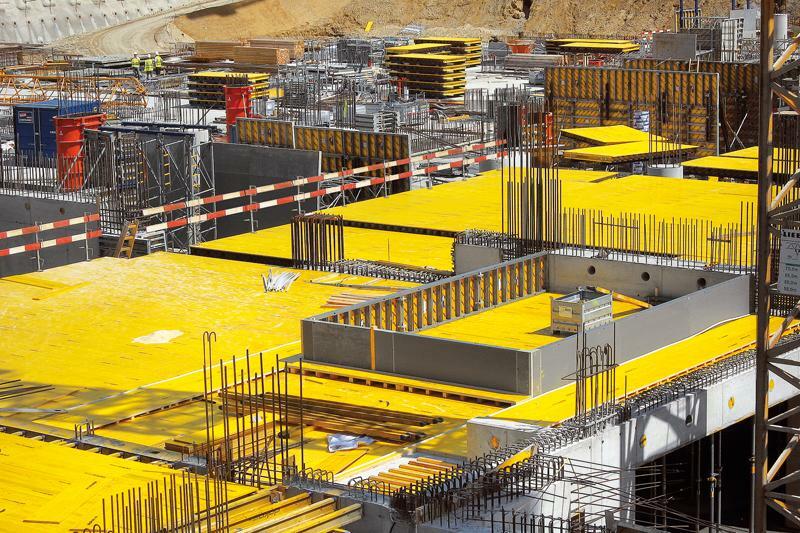 Working closely with the Site Management, Doka’s Vienna Branch devised a detailed and far-sighted formwork concept that is rigorously geared to achieving materials-optimised forming operations with the aid of just-in-time deliveries. Apart from taking a lot of pressure off the site logistics, with their limited storage facilities, the main benefit of this concept is to avoid the costly “just-throw-more-equipment-at-it” approach. A key ingredient of this integrated formwork planning is the way in which the formwork equipment available on-site at any time is scheduled so that it fits in exactly with the progress of work in the various casting sections. 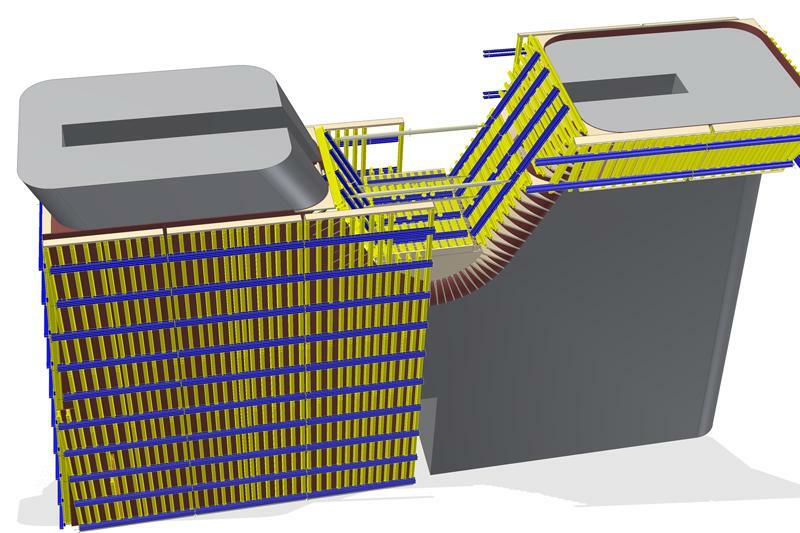 This ensures an optimum degree of equipment utilisation throughout the entire shell construction phase, leading to high productivity in the formwork operations as a whole. The Vienna Branch liaises regularly with the Site Management team, permitting ongoing optimisation of the processes on the basis of day-to-day experience. 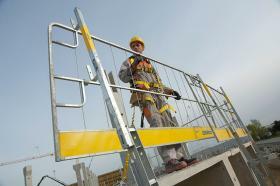 Doka’s efficient rental park in Vienna makes it possible to meet any unforeseen needs for extra equipment, that was not envisaged in the original plan, at short notice – which is essential if a construction project of this size is to have any chance of being carried out efficiently and, above all, without delays. The main systems being used to construct the voluminous transportation station, which extends across three storey levels, are Framax Xlife framed formwork panels and Dokamatic tableforms. The framed formwork system Framax Xlife comes into its own here with its versatile system-grid for easily and economically adapting to the varying layouts, and by being so easy to clean on-site. For forming the slabs, maximum speed is being ensured by the large-area Dokamatic tables. Also, the massively dimensioned (up to 2 m thick!) ground-source heat collectors on the shallow foundation structure were formed using Framax Xlife panels. The track-bearing structures next to the above-ground distributing-concourse level of the transportation station, and the five approx. 12 m wide island platforms, are being cast using reinforced Dokamatic tables on extra-high-capacity Staxo 100 load-bearing towers and with stop-end formwork made of Framax Xlife panels. In addition to the deliveries for the station, Doka’s Vienna Branch is also supplying all the formwork equipment for the many flyover structures in the “Anlage Ost” construction section. For example, the superstructures of the three railway bridges being built across the Argentinier-Strasse, Mommsen-Gasse and Ghega-Strasse thoroughfares are also being formed with a combination of reinforced Dokamatic tables and Staxo 100 load-bearing towers. Large-area elements of Doka formwork Top 50 have been fielded for the work on the eastern burrowing junction, which will run beneath the railway tracks for around 1200 m. The large gang-forms made possible by the Top 50 system deliver great speed and efficiency here. 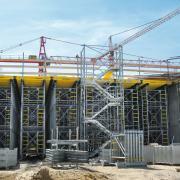 Thank you for your interest - Optimised formwork concept for huge railway-station project. 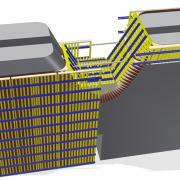 Thank you very much for your interest - Optimised formwork concept for huge railway-station project.